Car seats that automatically buckle. Children sit down and harnesses lower over them, just like the safety bars on amusement park rides. No parental involvement necessary. Self-washing and folding laundry. Enough said. A personal chef. I don't ask for much, just someone who can prepare nutritious meals that every member of my family simultaneously likes. Just that. A sensor that lets me know if a sippy cup full of milk has been hidden in a pile of toys before days pass and an unassuming child unearths the cup and begins drinking. A stickiness-repellent for floors and tabletops. This repellant also could be applied to doorknobs, light switches, walls, and all other hard and soft surfaces. It would be all-purpose and effective, kind of like Duct tape except that it would repel rather than adhere. In essence, a force field. An object finder so whenever a child asks, Have you seen my [left shoe, homework, book, stuffed animal, pebble, plastic thingy, or picture that I colored three weeks ago? ], I could hand over the finder, let the child track her own errant belongings, and conserve my mental exertion. A finder for the object finder, in the off-chance that it would get misplaced next to the sippy cup of curdled milk. What would you like to receive this Mother's Day? 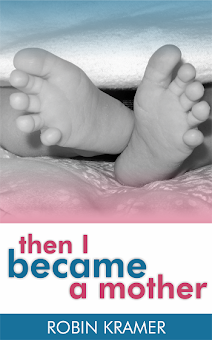 Check out Then I Became a Mother: humor, hope, and encouragement for moms! Available in both Kindle and paperback editions. Enjoy this gift you really can give! I'll do number three for you as long as you remover the last seven words. Number four made me gag (as I'm sure it did the unassuming child). Honestly, for Mother's Day, I'd cherish alone time. Just a few hours; me, a good book, a tall, cold Diet Coke and maybe some Cheetos. The finder of sippy cups would be worth its weight in gold. I'd also take some kind of service that would check all the pockets of pants in the dirty clothes to check for crayons, food, animals, or toys. That way there wouldn't be any surprises when I open the washing machine. Yes, that's very good. I'd take that, too. I'm left with one pressing question: have you discovered any animals in your kid's pockets? Ah, Mom Chef, I surely hope that your wish list comes true. I couldn't have said it better myself! I love it! ANYTHING that consistently makes learning, eating healthy, and practicing good manners MORE INTERESTING than Mario and Disney channel. Yes! This one is not to be overlooked! Thanks for the daily humor! My pleasure entirely! So glad that you liked the post!